I had the day off today and a couple of projects to finish up. Everyone has an ego wall/corner/room. It's where you gather your accomplishments and start thinking about what's next. It might be in your office at work, or in your closet or wherever. We've always had a little area in our office upstairs with diplomas, certificates and awards. When I started running, I never thought I'd be a person who had medals. I could barely make it down the street and looked for houses from which I could call Tim to come and pick me up. When we ran our first 5K, it was the first time I'd ever run that long. Now that I've worked so hard to earn my medals, I don't want to stuff them in a box or leave them in a pile. 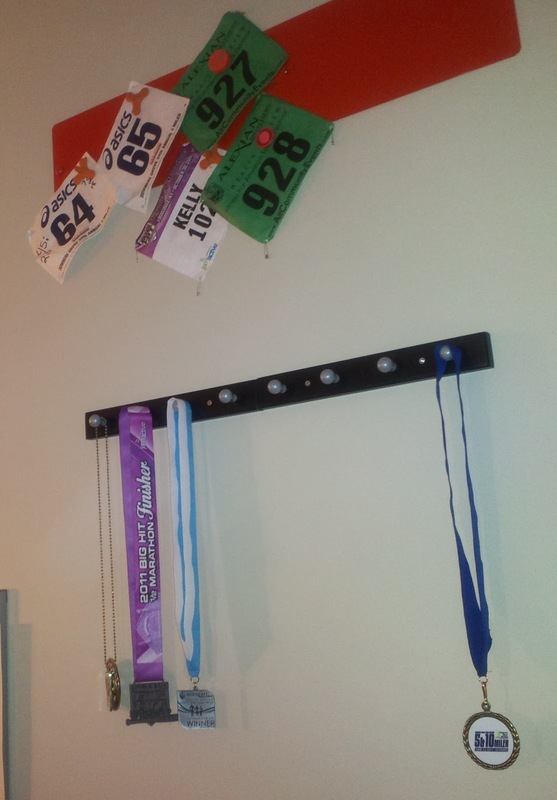 I also can't justify a fancy medal holder, so I wanted to make a homemade medal display. The last time I was at IKEA, I picked up a magnetic board, frames and hooks. 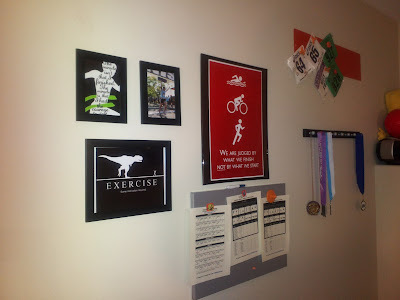 Today, I installed it all, along with a photo from the Fort2Base Race and some motivational items. There's lots of room to grow on this medal rack, so we'll see what the next year holds. Let me know what you think! Also, enjoy this awesome Christmas lights video. I can't believe it's already Christmas Eve's Eve! I'm really excited for Christmas this year. Last year, the gifts I bought fell a little short (wrong sizes, not what people wanted, etc.). This year, I'm out for redemption and I'm really excited to see everyone open their gifts. Oh, that was an image I found on Pinterest that I got printed onto an 8X10 photo at Walgreens. It says "Exercise. Some motivation required." This is such a great idea! I need to get motivated to put something like this together. What a great idea! I love what you've done with your bibs! I hang up my medals, but I just put all my bibs, along with photos and finisher certificates, if I have them, in a 3-ring binder scrapbook.